3. Find the application you must authenticate. 4. Click on that application to enter the "App Details" screen. 5. If an integration agent is required, you will see a red exclamation mark signifying that an action must be taken. Click on the "Integration" tab. "Warning: An integration agent has not been set up for this product. You can SETUP the integration or DELEGATE the setup to a team member." To Authorize an integration, click "SETUP"
7. The Integration Configuration screen will pop up in your browser window. You must enter the required data in the "Create Agent" step before moving on to authorize. Once you have filled in required info and hit next. 8. Not all integrations are the same when it comes to authorization. For some, you will need to enter your username and password into the SaaS Manager application, others require an API key, others OAuth 2.0. For information on specific integrations, visit " Integration Instructions" in Help&Docs. 10. 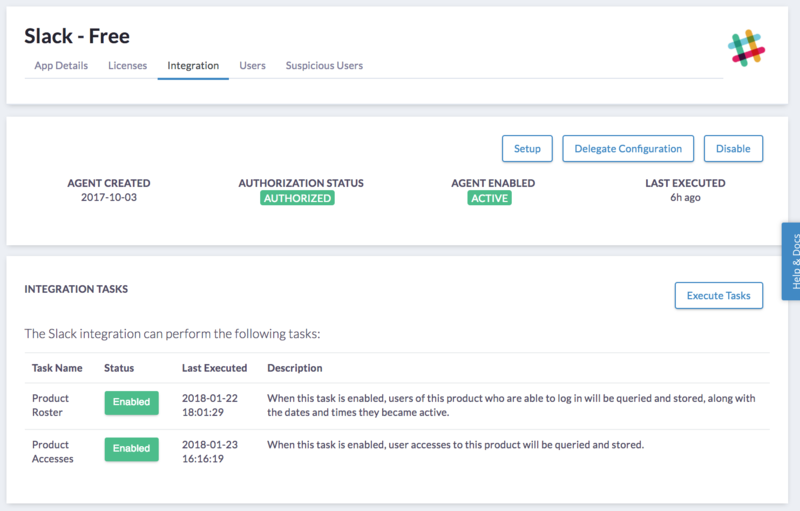 Once you have entered appropriate authorization information you can continue with the integration agent setup. 13. Save the integration agent. An integration with an active agent should look similar to the screenshot below.